Tom Hill's book "Making Character First." Linda Manaugh (Metro Techonlogy Centers) accepts award of appreciation for her dedicated service in providing OK Ethics agendas and handouts. Joe Walker (Grant Thornton) is thanked by OK Ethics VP Chade Nash for his help with the registration team. Bobby Redinger (Cole & Reed) and Sheree Murray (SNU) are among those honored at the annual Volunteer Appreciation luncheon, held in conjunction with our regular programming. 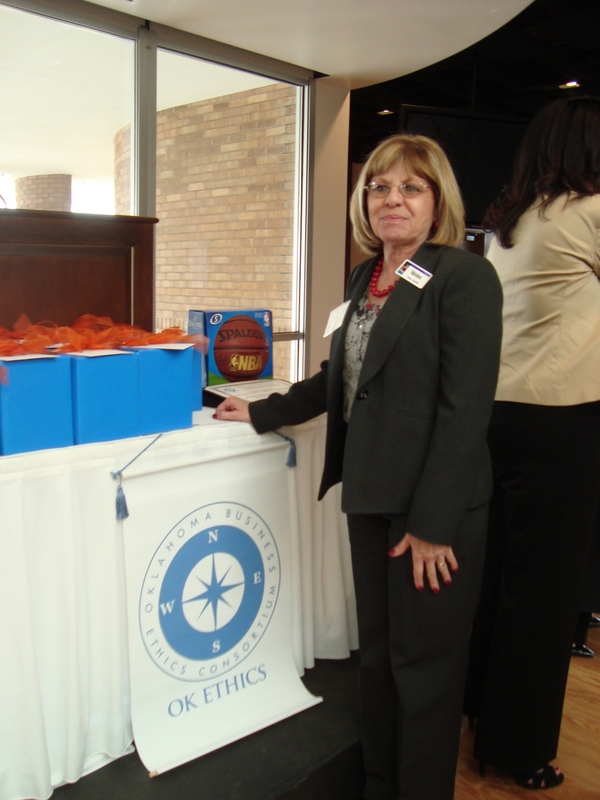 Tess Smith with Walker Companies hangs the OK Ethics banner that her company donated. Linda Streun helps distribute programs agendas prior to the event. Bobby Redinger distributes the nearly 350 agendas that she provided for this event. Connie Barwick of Maximum Multi Media prepares the pre-meeting slide show. Kirk Kickingbird pose with moderator Dr. Jim Collard. 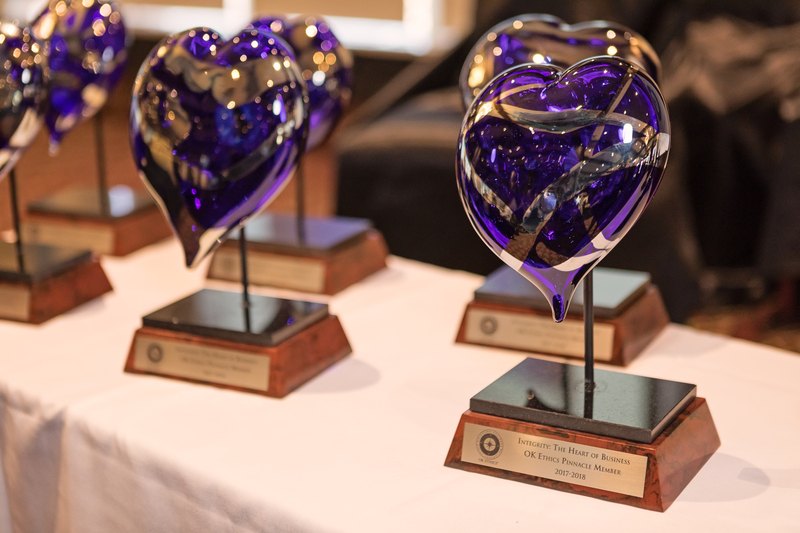 November 14 marked an historic occasion for the OK Ethics Foundation when teams from Oklahoma City University and the University of Central Oklahoma competed for the FIRST time in a regional college ethics bowl sponsored by St. Mary's University in San Antonio. Among the twenty universities competing, UCO placed fifth and OCU placed ninth. The OK Ethics Foundation gives a special thanks to Enterprise Rent-A-Car and especially Shannon Hiebert for making the $2500 grant possible in order to cover the students' and advisors' travel expenses. Oscar Jackson, a charter member of the OK Ethics Compass Award team and Cabinet Secretary to Governor Henry, poses with Lieutenant Governor Jari Askins and OU Women’s Basketball Coach, Sherri Coale. The tables are set as the 2009 OK Ethics Compass Awards begin. A full house gathers for the fourth annual Compass Awards at the inaugural event for Jim Thorpe Sports Museum. The compass awards are ready to be presented. Volunteers are ready to greet the crowd of nearly 400 attendees at the Jim Thorpe Sports Museum. OK Ethics members enjoy networking opportunities at the 2009 Compass Awards event. Principal Techologies, Pam Fountain speaks to crowd. 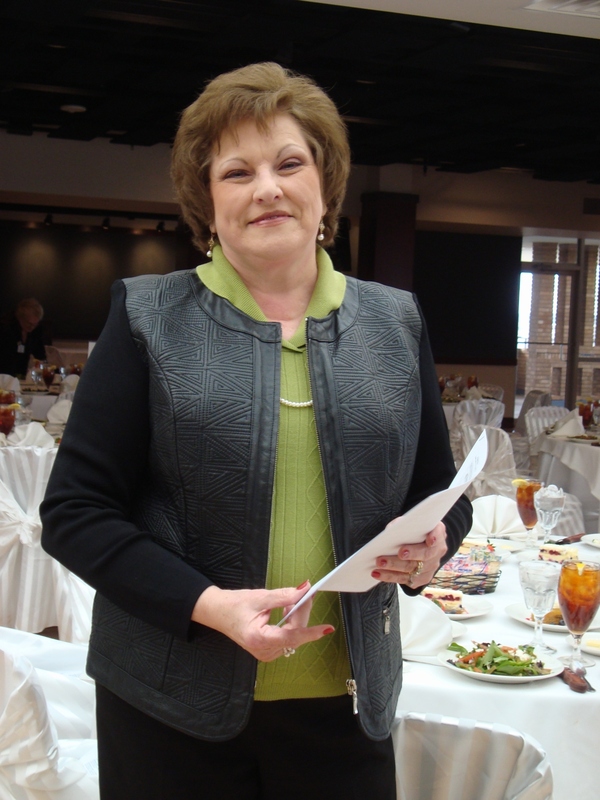 Pam Fountain, Principal Technologies, accepts 2008 Compass award for Small Business category. Okethics cannot succeed without the help of volunteers. Mary Kay Huggard (Principal Technologies) and Greg Byers (Sinclair Broadcasting) have efficiently spearheaded OKC's registration for two years. We are extremely grateful! Bob Byrne at the podium, while Shannon Warren expresses appreciation for Connie Barwick for her dedicated service to OkEthics. Bob Byrne (Boeing) at the podium while group applauds Joshua Jantz of the Character First Institute for his dedicated service as an OkEthics volunteer. Tom Hill (COO of Kimray, Inc.) illustrates his character point at the November, 2007 meeting hald at the Character First Institute in OKC. Tom Hill continues with his demonstration to an attentive audience. Brian Fayak of Nextep (Norman) accepts the Navigator memership award from OkEthics at the presentations made in November, 2007. Janic Dobbs from Devon Energy accepts the Navigator membership award. Sheila Lawrence of Express Personnel accepts the Star Membership level award. Chade Nash of Gabbard accepts Leading Member Award. Diana Wall of Accel Financial Staffing Solutions accepts the Leading Member Award. Myrna Latham from McAfee and Taft accepts the Leading Member Award. Marian Combs of OBU International Graduate School accepts the Leading Member Award. Cheasapeake Energy Team enjoys OKC November 2007 meeting. General Burpee and Mike Lyles talk at the September 2007 luncheon. OkEthics selects new logo - 2006 Tulsa member David White holds a poster showing logo options designed by Cicero International Advertising.